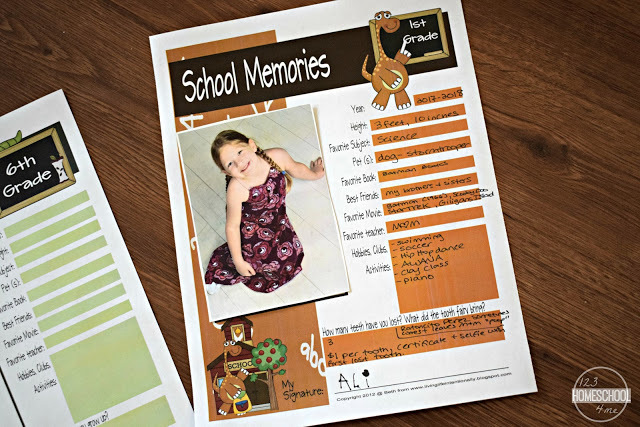 As part of my continued effort to bring you great homeschool resources, here is a resource to not only help you get organized and keep good records, but help see your child’s strengths. 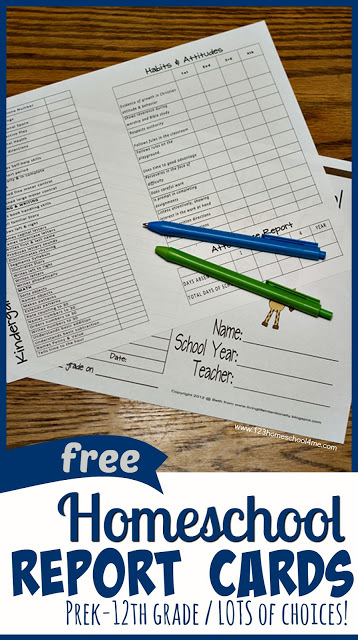 There are lots of choices in these free homeschool report cards! Just download and print the reports cards on both sides of the paper. 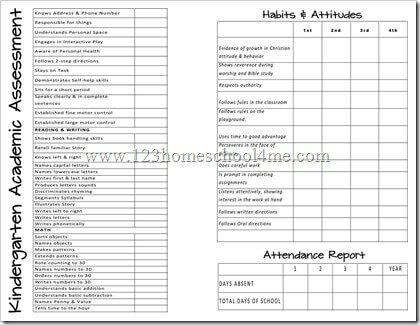 There are cute report cards for elementary age kids and more traditional looking report cards for older grades. Plus there are various choices for the inside depending on if you want to give grades, check off skills, etc. 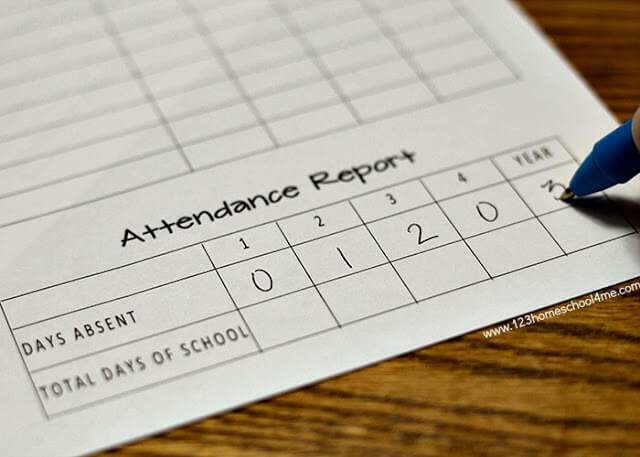 Should your Homeschool Student have a Report Card? Now, right off the bat I want to tell you that I did not do report cards for the younger years. I was much more interested in having them actually understand the material and develop a love of learning! If they don’t understand something I am not going to just give them a bad grade and move on. We are going to reteach, practice, and reevaluate if they comprehend the material. I don’t want them to be worried about grades – isn’t that one of the perks of Homeschooling?!? 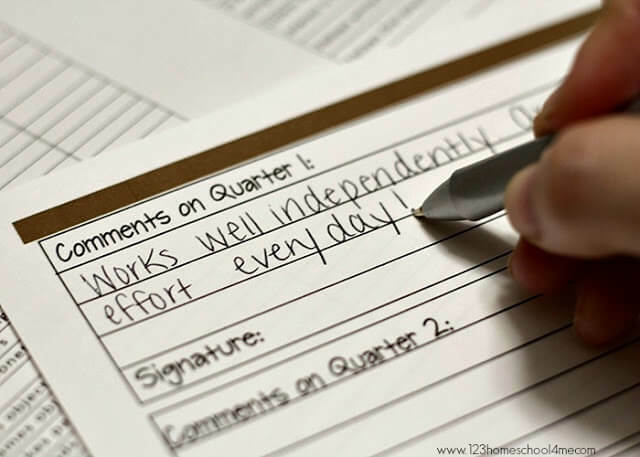 Report Cards help kids learn to take constructive criticism. Not everything kids hear in a report card or job evaluation is going to be positive. And for that matter, they may not agree with how they were evaluated. But it is a good skill for kids to learn what information they need to listen to to make improvements on (we all have something we should improve on) and what areas are subjective and they may not want to change. Report Cards help kids start to see what they are good at. They learn their are certain objectives, absolutes that they must reach. If they don’t, they need to work harder, try a different strategy, or they may no be the best at that area. And THAT’S OKAY. Not everyone is going to be a doctor or nuclear physicist. They don’t all need to get A’s in Math. Report Cards Give us Records. It is important that we have records that show we did indeed teach our children and that they were learning the material. These records will be used down the road for various things including college entrance materials and graduation records. Report cards help make us accountable to carefully evaluate our child’s efforts, progress and work to make sure they are succeeding. If not we may need to tweak the curriculum, teaching style, or get some additional help. Report Cards are the Norm. Although I’m not a big fan of doing things because everyone else does, there are certain things that we all should know what it is and have an experience with because that is “what people do“. Every kid has ridden the bus (so we ride it at the fair), every kid has taken a sack lunch, every kid had a frustrating teacher (that is what extracurriculars are for), etc. Report Cards are part of what people remember from their schooling years and now your child will understand that common reference point too. 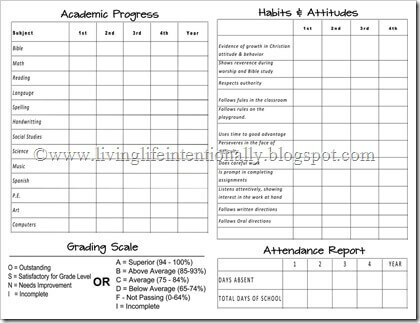 6 Report Card Backs (so you can choose the one that works best for your particular child/family). There is a specific one for Kindergarten, several options using subjects as the criteria and grading either (Outstanding, Satisfactory, Needs Improvement, Incomplete) OR standard grades (A,B,C,D,F,I), and options for using one based on checking off areas completed. I would recommend waiting until 4th or 5th grade to begin accessing actual grades. At that point it is good prep for the Jr.High/High School years (this is just my opinion).